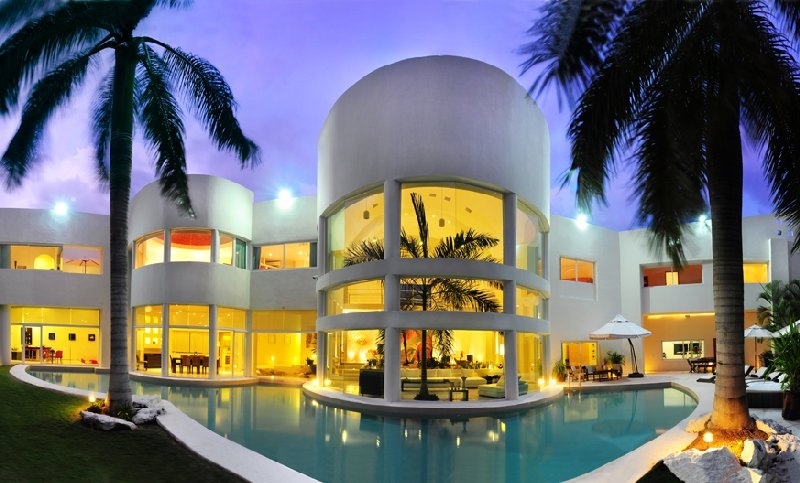 Villa Aqua is a magnificent Zen style boutique villa located on the 18 hole golf course in Playacar, Playa Del Carmen. The expansive 13000 sq foot villa exuding light and tranquility boasts a beautiful indoor garden with water features. The curved glass floor to ceiling windows offer stunning pool and tropical garden views, relax and enjoy from the plush sofas in the garden living room. There is a spiral stair case elegantly stretching through the entrance area leading to the second floor. The villa boasts porcelain flooring and Catalan vaulted ceilings. Glorious colors of furnishings, art and halogen lighting contrast and combine with the white simplicity of this beautiful home. The indoor dining area has seating for 10, the fully equipped gourmet kitchen is just off this area. A sunken level family room has television and also a bar area overlooking the pool and garden. Walking through the sliding doors you meet the unique circular swimming pools that flank practically the entire stretch of the villa. There is an outdoor dining area, perfect for dining alfresco. 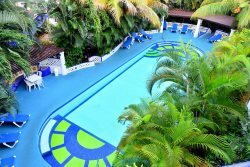 There are sun loungers lining the pool terrace to ensure your comfort as you relax with the Caribbean sun. There are 2 sumptuous garden suites with pool views on the first level. Also leading from the pool area is a large gymnasium with squash court, perfect for the sporting enthusiasts. On the upper level are 3 suites. The incredible master suite boasts 2 ensuite baths, walk-in closets, a Jacuzzi overlooking the garden, a tranquil massage area and private terrace. All suites have TVs and telephones. On the upper level is an entertainment area with Satellite TV, DVDs and library. Playa Del Carmen famous 5th Avenue is just a short distance away, as is the Beach Club. The Playacar 18 hole golf course is right on your doorstep, there are many spectacular sights in the Mayan Riviera waiting to be discovered. The housekeepers and concierge are on hand to make you feel truly pampered in the luxurious surroundings. Every detail is thought of to make this a very special and relaxing vacation at the blissful Villa Aqua!